This web update is long overdue as much has changed in the last few weeks. The weather has been a roller coaster of both temperature and precipitation. We finished planting corn in the evening on mother’s day. It was borderline too wet to be planting, but more rain was forecasted. The week following was wet and cold, we received over 3.5” of rain. 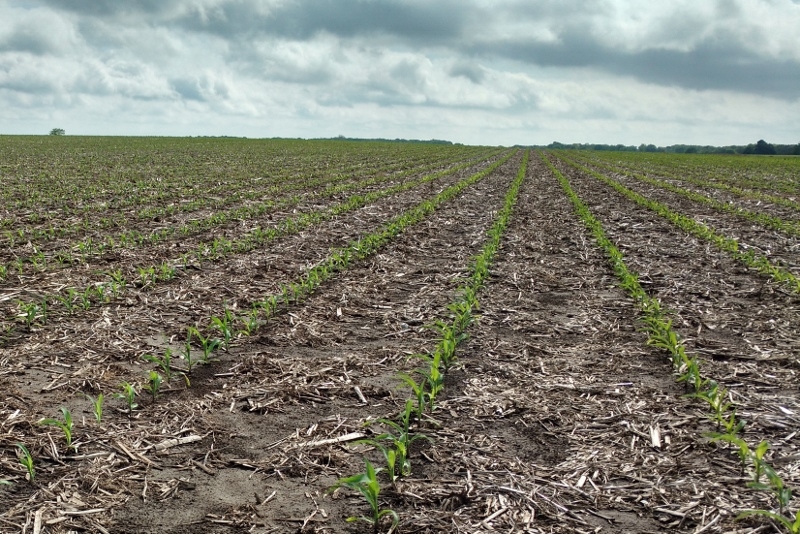 The combination of cool temperatures and saturated soils was hard on the emerging corn. Rod and Dave ended up rotary hoeing over 300 acres, most of it twice, trying to help the corn out of the ground. Since then is has warmed up and it doesn’t look like we have any corn we’ll have to tear up and replant, but may have to spot some in in the wetter areas of a few farms. We anticipated we were going to have cut worm problems this year due to the high number of moths we caught in our pheromone trap here at the shop during March. This problem never seemed to materialize as the cutting we saw was early and under the 3% threshold for spraying. We had a light frost on the nights of the 13th and 14th that effected some of the low lying areas in the early planted corn. Stand counts show we probably lost 1-3000 plants per acre in those fields, not enough to warrant replanting. Another issue we have seen for the first time reducing our corn stand is bird damage. Black birds and crows have been digging up the emerging plants and eating the seed germ. Some areas we have lost 3-6000 plants per acre to their damages. Overall the corn stands are average to slightly below, but we still should have the opportunity to raise an average crop. Soybean planting was started on the 20th and completed on the 25th. We were able to run two planters after I finished spraying and more than half of the beans were planted on the days of the 24th and 25th. We received an inch of rain the morning of the 26th. The rain and much warmer temperatures had the first planted beans jumping out of the ground in 5 days. Next on the agenda we will be pulling our soil nitrate samples in all the corn fields to prepare for side-dressing nitrogen next week. After that it will be on to post spraying the corn. As always the mowing never ends in this warm wet weather and we are also in the process of rebuilding and reseeding a large waterway on the Rudasill Wilson farm.